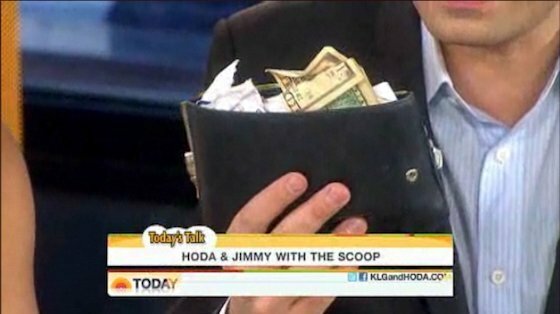 Jimmy Fallon stood in for Kathie Lee Gifford on the fourth hour of the "Today" show Thursday, and he and Hoda Kotb wound up having a long discussion about the insanity of Kotb's huge, disorganized wallet. It all started when Kotb ridiculed Fallon's wallet, saying it was too small. He shot back, calling her wallet "morbidly obese" and "the most insane wallet I've ever seen. "He mocked the wallet so much, in fact, that Kotb had one of the production crew go and fetch it from her dressing room so the audience could see it. The wallet was brought out-- and it was huge, with a tissue and ten-dollar-bill hanging out of it. "This is like 'Hoarders!'" Fallon exclaimed. "You have a problem!" Fallon also showed off some serious "West Side Story"-style dance moves during Kotb's "iHoda" segment.